This is a book based on Luke’s Gospel concentrating on how Luke followed God’s law of context to write an account of Jesus’ ministry. This book points out the laws of context Luke followed, showing how each was used in his book to draw attention to details and lessons. What does the world do to God’s Bible? They separate a few verses or a single story then try to tell you what they think it means. They may hit on a few details sitting on the surface. They may see a part of the lesson, but this book will begin to tell you how much has been missed. It’s time to stop using the Bible as a reference book or some sort of dictionary that tells people what the meaning of a concept, doctrine, or tradition is, and look at it the way God wrote and constructed all of the sixty six books we call the Bible. The Bible was never intended to be a dictionary to pull of a shelf to look for proof to support a preconceived idea. The Bible is a collection of stories arranged by an Infinite God to tell us about His plan of salvation, how His Son provided the perfect sacrifice, and how that plan will be fulfilled. This entire book was written by following a few basic rules of context. This book also explains those rules of context in simple terms by showing when, where, and how Luke used those rules to write his Gospel. 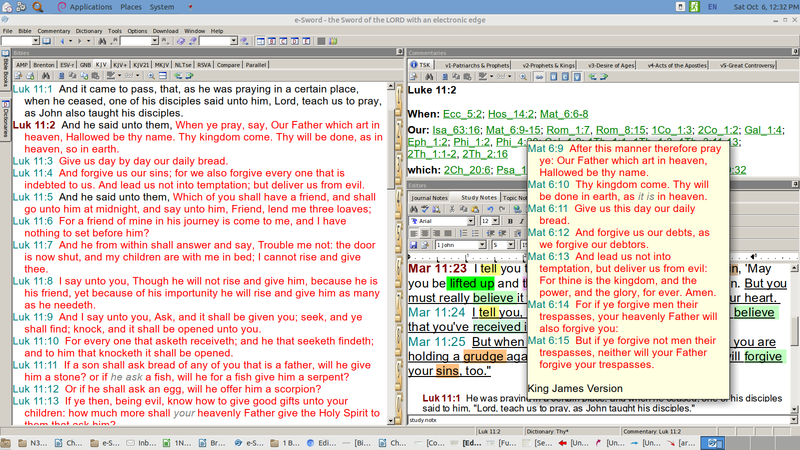 A special Bible graphic has been added to the stories reviewing the rule Luke introduced and used. Those rules of context are consistent throughout the Bible. Once you learn a few of those simple rules, you’ll see God’s Word open up in a way you never imaged. You’ll also see God’s Spirit is alive and well, and still working 24/7 to reach this fallen world. If your one of those Christians who’ve been told, “God’s Spirit just doesn’t talk to this world anymore,” or, “we already have all the information we need,” you gotta read this book and share it. I wanted to try something a little different in this book. I really want to write stories about the events and characters in Luke’s book describing the scenes and lessons. But my ministry is to teach people how to study the Bible on their own. I’ve always wondered how people did it. You know, how they look up texts and links between texts in different chapters and books. God blessed me with the opportunity to learn from some of the best. After writing a number of books on Bible study, I thought it was time to write a book with interesting stories and descriptions while throwing in a few lessons about how to study the Bible. My back ground in Bible study is not formal. I learned a few details from a few people who were able to explain study methods. I found it difficult to find people who actually study their Bibles. Most people consider a casual reading, opening up to a few chapters at random, or following a read through the Bible in a year program was Bible Study. 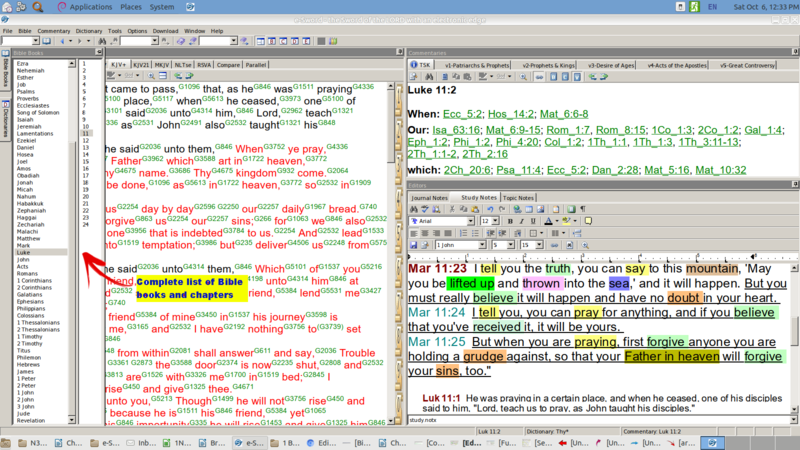 Others think going over some preprinted material is studying their Bible. The sad fact is,most Christians want someone to study for them, then provide an condensed answer in the shortest time possible. The people I’ve learned from have seen this same phenomenon throughout Christianity. One of my main mentors has been Dr. Lee Gugliotto, author, teacher, and retired pastor. His online courses have been helpful beyond imagination. Not only have they been a real eye opener along the lines of Bible Study, but what people will do with that information. Very few people seem to have the interest and dedication to open their Bible, and use those simple rules of context we’ve learned. For me, it has become a life style. Something I have a great desire to share. Of course once I dove deeper into God’s Word, God made sure He surrounded me with people at and near the same level, as well as a few at a much higher level. Of course there has always been people with an interest to learn more. Finding out what those people were ready for was discussed in previous books, and of course we will cover details Jesus taught about how and when to reach people – on all levels. In this book, I am going to provide a copy of the entire chapter with key words highlighted. This will help you to see how the author called attention to major and minor details. As we go through each chapter in detail, you’ll see why God arranged His inspired word in this particular way, which is consistent throughout the Bible. This can best be described as a Study on a Page. Now it’s time to take an unforgettable journey though Luke’s Gospel. Click here to purchase this book in print. 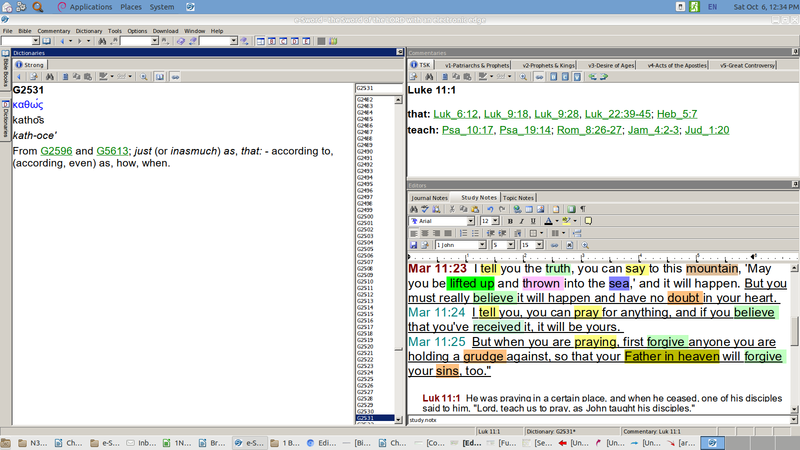 Luke 1:1-80 NLTse Many people have set out to write accounts about the events that have been fulfilled among us. (2) They used the eyewitness reports circulating among us from the early disciples. (3) Having carefully investigated everything from the beginning, I also have decided to write a careful account for you, most honorable Theophilus, (4) so you can be certain of the truth of everything you were taught. (5) When Herod was king of Judea, there was a Jewish priest named Zechariah. He was a member of the priestly order of Abijah, and his wife, Elizabeth, was also from the priestly line of Aaron. (6) Zechariah and Elizabeth were righteous in God’s eyes, careful to obey all of the Lord’s commandments and regulations. (7) They had no children because Elizabeth was unable to conceive, and they were both very old. (8) One day Zechariah was serving God in the Temple, for his order was on duty that week. (9) As was the custom of the priests, he was chosen by lot to enter the sanctuary of the Lord and burn incense. (10) While the incense was being burned, a great crowd stood outside, praying. (11) While Zechariah was in the sanctuary, an angel of the Lord appeared to him, standing to the right of the incense altar. (12) Zechariah was shaken and overwhelmed with fear when he saw him. (13) But the angel said, “Don’t be afraid, Zechariah! God has heard your prayer. Your wife, Elizabeth, will give you a son, and you are to name him John. (14) You will have great joy and gladness, and many will rejoice at his birth, (15) for he will be great in the eyes of the Lord. He must never touch wine or other alcoholic drinks. He will be filled with the Holy Spirit, even before his birth. (16) And he will turn many Israelites to the Lord their God. (17) He will be a man with the spirit and power of Elijah. He will prepare the people for the coming of the Lord. He will turn the hearts of the fathers to their children, and he will cause those who are rebellious to accept the wisdom of the godly.” (18) Zechariah said to the angel, “How can I be sure this will happen? I’m an old man now, and my wife is also well along in years.” (19) Then the angel said, “I am Gabriel! I stand in the very presence of God. It was he who sent me to bring you this good news! (20) But now, since you didn’t believe what I said, you will be silent and unable to speak until the child is born. For my words will certainly be fulfilled at the proper time.” (21) Meanwhile, the people were waiting for Zechariah to come out of the sanctuary, wondering why he was taking so long. (22) When he finally did come out, he couldn’t speak to them. Then they realized from his gestures and his silence that he must have seen a vision in the sanctuary. (23) When Zechariah’s week of service in the Temple was over, he returned home. (24) Soon afterward his wife, Elizabeth, became pregnant and went into seclusion for five months. (25) “How kind the Lord is!” she exclaimed. “He has taken away my disgrace of having no children.” (26) In the sixth month of Elizabeth’s pregnancy, God sent the angel Gabriel to Nazareth, a village in Galilee, (27) to a virgin named Mary. She was engaged to be married to a man named Joseph, a descendant of King David. (28) Gabriel appeared to her and said, “Greetings, favored woman! The Lord is with you!” (29) Confused and disturbed, Mary tried to think what the angel could mean. (30) “Don’t be afraid, Mary,” the angel told her, “for you have found favor with God! (31) You will conceive and give birth to a son, and you will name him Jesus. (32) He will be very great and will be called the Son of the Most High. The Lord God will give him the throne of his ancestor David. (33) And he will reign over Israel forever; his Kingdom will never end!” (34) Mary asked the angel, “But how can this happen? I am a virgin.” (35) The angel replied, “The Holy Spirit will come upon you, and the power of the Most High will overshadow you. So the baby to be born will be holy, and he will be called the Son of God. (36) What’s more, your relative Elizabeth has become pregnant in her old age! People used to say she was barren, but she’s now in her sixth month. (37) For nothing is impossible with God.” (38) Mary responded, “I am the Lord’s servant. May everything you have said about me come true.” And then the angel left her. (39) A few days later Mary hurried to the hill country of Judea, to the town (40) where Zechariah lived. She entered the house and greeted Elizabeth. (41) At the sound of Mary’s greeting, Elizabeth’s child leaped within her, and Elizabeth was filled with the Holy Spirit. (42) Elizabeth gave a glad cry and exclaimed to Mary, “God has blessed you above all women, and your child is blessed. (43) Why am I so honored, that the mother of my Lord should visit me? (44) When I heard your greeting, the baby in my womb jumped for joy. (45) You are blessed because you believed that the Lord would do what he said.” (46) Mary responded, “Oh, how my soul praises the Lord. (47) How my spirit rejoices in God my Savior! (48) For he took notice of his lowly servant girl, and from now on all generations will call me blessed. (49) For the Mighty One is holy, and he has done great things for me. (50) He shows mercy from generation to generation to all who fear him. (51) His mighty arm has done tremendous things! He has scattered the proud and haughty ones. (52) He has brought down princes from their thrones and exalted the humble. (53) He has filled the hungry with good things and sent the rich away with empty hands. (54) He has helped his servant Israel and remembered to be merciful. (55) For he made this promise to our ancestors, to Abraham and his children forever.” (56) Mary stayed with Elizabeth about three months and then went back to her own home. (57) When it was time for Elizabeth’s baby to be born, she gave birth to a son. (58) And when her neighbors and relatives heard that the Lord had been very merciful to her, everyone rejoiced with her. (59) When the baby was eight days old, they all came for the circumcision ceremony. They wanted to name him Zechariah, after his father. (60) But Elizabeth said, “No! His name is John!” (61) “What?” they exclaimed. “There is no one in all your family by that name.” (62) So they used gestures to ask the baby’s father what he wanted to name him. (63) He motioned for a writing tablet, and to everyone’s surprise he wrote, “His name is John.” (64) Instantly Zechariah could speak again, and he began praising God. (65) Awe fell upon the whole neighborhood, and the news of what had happened spread throughout the Judean hills. (66) Everyone who heard about it reflected on these events and asked, “What will this child turn out to be?” For the hand of the Lord was surely upon him in a special way. (67) Then his father, Zechariah, was filled with the Holy Spirit and gave this prophecy: (68) “Praise the Lord, the God of Israel, because he has visited and redeemed his people. (69) He has sent us a mighty Savior from the royal line of his servant David, (70) just as he promised through his holy prophets long ago. (71) Now we will be saved from our enemies and from all who hate us. (72) He has been merciful to our ancestors by remembering his sacred covenant– (73) the covenant he swore with an oath to our ancestor Abraham. (74) We have been rescued from our enemies so we can serve God without fear, (75) in holiness and righteousness for as long as we live. (76) “And you, my little son, will be called the prophet of the Most High, because you will prepare the way for the Lord. (77) You will tell his people how to find salvation through forgiveness of their sins. (78) Because of God’s tender mercy, the morning light from heaven is about to break upon us, (79) to give light to those who sit in darkness and in the shadow of death, and to guide us to the path of peace.” (80) John grew up and became strong in spirit. And he lived in the wilderness until he began his public ministry to Israel. I’m not sure how to approach this. For one thing, I’ve never seen a book like this, and I thought I would just write stories about Luke’s book, and add a few details about how to study the Bible. 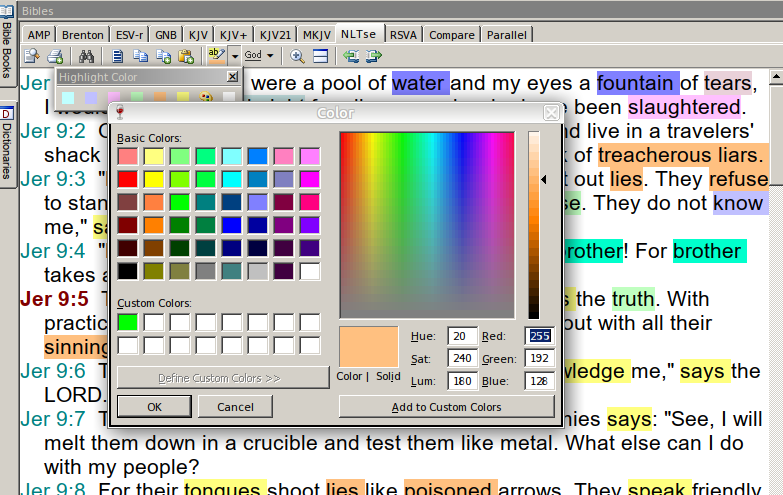 To really understand the study method I use, you have to see how key words are highlighted. Luke 1:1-4 NLTse Many people have set out to write accounts about the events that have been fulfilled among us. (2) They used the eyewitness reports circulating among us from the early disciples. (3) Having carefully investigated everything from the beginning, I also have decided to write a careful account for you, most honorable Theophilus, (4) so you can be certain of the truth of everything you were taught. I love the way Luke begins his book. The first thing Luke pointed out was, “many people have set out to write accounts about the events that have been fulfilled among us.” I know how he feels. A lot of books have been written about Jesus. Even in Luke’s day, books about Jesus were popular. You’ll notice Luke doesn’t bother going into detail about those other books. Some people think he is referring to the other three gospels. We don’t know that for certain. We can assume Luke may have read those other books, but Luke did tells us, “They used the eyewitness reports circulating among us from the early disciples.” This statement leads us to believe Luke read those other books, and may have used them as references while writing His own book. Luke also went into a some details about how he gathered information. “Having carefully investigated everything from the beginning, I also have decided to write a careful account for you, most honorable Theophilus, so you can be certain of the truth of everything you were taught.” This shows Luke looked into claims from those other books, then decided to write a book of his own to set the record straight. We have no idea what other books Luke may have read. Other modern books cover some possibles. I prefer to stick to the Bible because I’ve found insurmountable proof the Bible is the inspired Word of God. I’ve found every detail we need to prove every point God considered important is backed up and proven with His Word. I see absolutely no reason to go outside of the Bible for any information. Well that’s true in 99% of all cases. There are a few little things we can use from other books to get an understanding of some of the events. As we progress through Luke’s Gospel, we’ll notice, Luke, nor any of the other gospel writers used any references from outside God’s scripture. 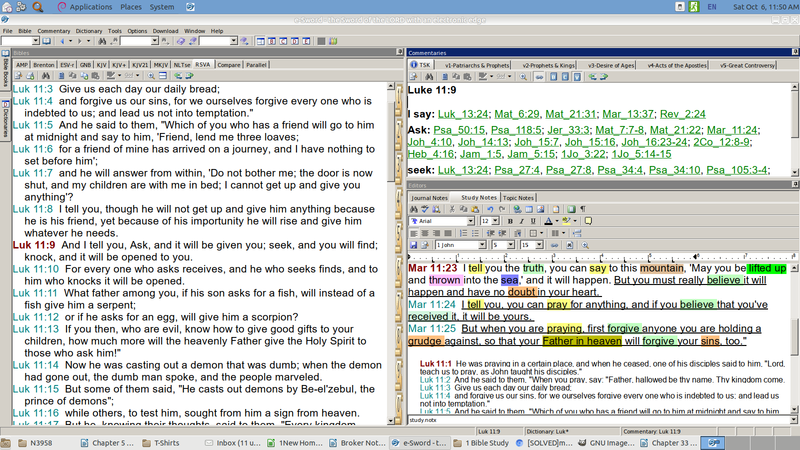 As a matter of fact, as we progress through Luke’s Gospel, we will see a pattern established when scripture is quoted. God had a reason to write sixty six books with minimal references to other books. Those few references were to a few missing books written by other prophets or chronicles about the kings of Judah and Israel. Of course there are a lot of useful books available today. Many of them dwell on history. There is one thing I’ve found while attempting to use outside sources to gather historical data. It is almost impossible to find two historians who agree. One thing is for certain. Eyewitness accounts of history can be and are often biased. Sometimes it is biased based on personal views. Other times it is biased based on the fact some historians were employed by the king in charge. Most kings insisted only their victories were recorded. Kings didn’t want the world to remember their set backs and defeats. If we look at and consider how history is recorded today, no one can deny opinions are biased and often distorted. A historian who idolizes a current president will record his life and actions far differently than a historian supporting the other party. In short, whenever we go outside of the Bible, we have to consider the source. God may be on trial…. but the evidence is in. The universe has seen what the accuser is capable of. He is his own character witness. On the other side of that trial, God doesn’t mind being questioned. As a matter of fact, He welcomes questions. God already recorded the answers in His book. This is what I’ve found as undeniable evidence, God is God and the author of the Bible. Luke 1:5-22 When Herod was king of Judea, there was a Jewish priest named Zechariah. He was a member of the priestly order of Abijah, and his wife, Elizabeth, was also from the priestly line of Aaron. (6) Zechariah and Elizabeth were righteous in God’s eyes, careful to obey all of the Lord’s commandments and regulations. (7) They had no children because Elizabeth was unable to conceive, and they were both very old. (8) One day Zechariah was serving God in the Temple, for his order was on duty that week. (9) As was the custom of the priests, he was chosen by lot to enter the sanctuary of the Lord and burn incense. (10) While the incense was being burned, a great crowd stood outside, praying. (11) While Zechariah was in the sanctuary, an angel of the Lord appeared to him, standing to the right of the incense altar. (12) Zechariah was shaken and overwhelmed with fear when he saw him. (13) But the angel said, “Don’t be afraid, Zechariah! God has heard your prayer. Your wife, Elizabeth, will give you a son, and you are to name him John. (14) You will have great joy and gladness, and many will rejoice at his birth, (15) for he will be great in the eyes of the Lord. He must never touch wine or other alcoholic drinks. He will be filled with the Holy Spirit, even before his birth. (16) And he will turn many Israelites to the Lord their God. (17) He will be a man with the spirit and power of Elijah. He will prepare the people for the coming of the Lord. He will turn the hearts of the fathers to their children, and he will cause those who are rebellious to accept the wisdom of the godly.” (18) Zechariah said to the angel, “How can I be sure this will happen? I’m an old man now, and my wife is also well along in years.” (19) Then the angel said, “I am Gabriel! I stand in the very presence of God. It was he who sent me to bring you this good news! (20) But now, since you didn’t believe what I said, you will be silent and unable to speak until the child is born. For my words will certainly be fulfilled at the proper time.” (21) Meanwhile, the people were waiting for Zechariah to come out of the sanctuary, wondering why he was taking so long. (22) When he finally did come out, he couldn’t speak to them. Then they realized from his gestures and his silence that he must have seen a vision in the sanctuary. The first thing Luke got into at the beginning of his book was the date. This is important. We see authors specifying dates using a reigning king to establish a time line. Sometimes this can be confusing, like in the case of Herod. 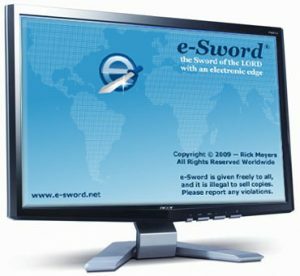 I use a free Bible Study program called E-Sword. With this free program, you can add a number of free Bibles. One you have to download is called the KJV+. 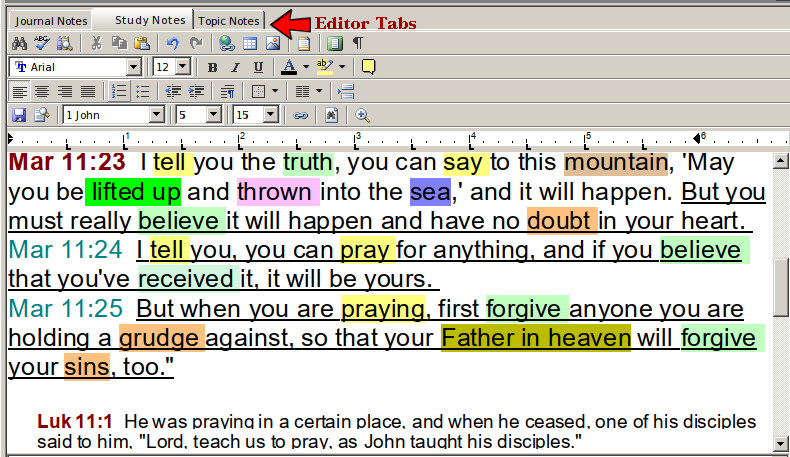 This is the version containing Strong’s numbers and works with the Strong Concordance, a very important Bible Study tool. In this example, I looked up the word Herod in the KVJ+, looked at the Strong’s number to find it was the name of four kings in Jerusalem. 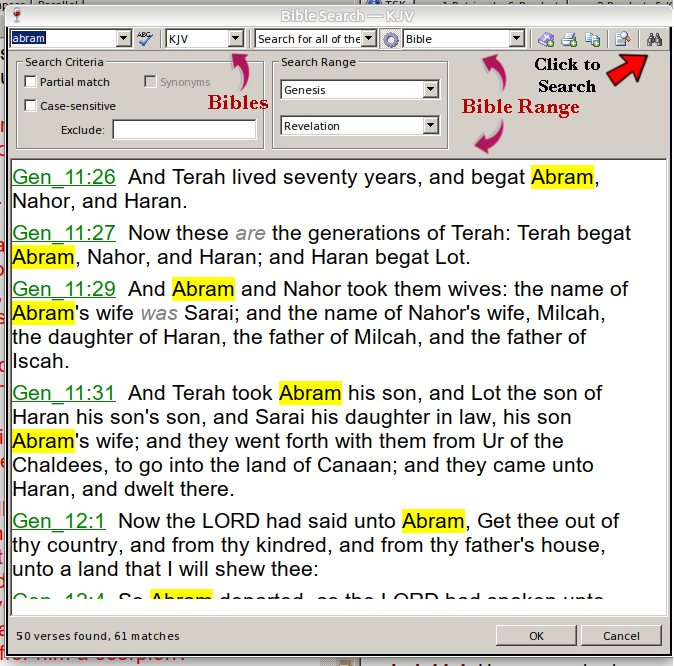 One of the Bibles you may want to buy is the NLTse (New Living Translation, second edition). Since those four kings named Herod spanned a long period of time, this may seem confusing. All I can tell you is, if God didn’t see a reason to set the exact date of this event, it may not be important. Then again, having a pretty good idea of how God wrote His book, some specific dates take a bit of digging in the Bible. But I’ve always been able to find the answers in the Bible. 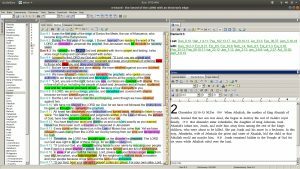 As a matter of fact, in this case, checking the other gospels will reveal additional information about which Herod Luke referred to, as well as using other references to zero in dates. That is a detail you can study on your own. That way you’ll see for yourself how God’s Spirit will bring out unexpected details. Talking about unexpected details, doesn’t it seem a little strange Luke would begin his book with a story about Zechariah and his son John? This brings up a number of important Bible Study rules.